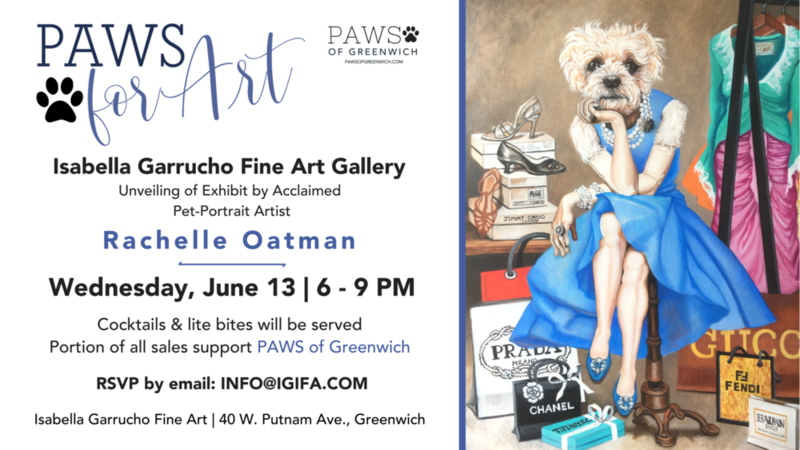 Isabella Garrucho Fine Art Gallery (40 W Putnam Ave., Greenwich) will debut their newest solo exhibition featuring a collection of anthropomorphic pet portraits by accomplished NYC-based artist, Rachelle Oatman. As part of the month-long, solo exhibition, Isabella Garrucho Gallery will donate a portion of proceeds from all sales to PAWS of Greenwich. To celebrate the opening and partnership, the gallery will host a “PAWS for Art” opening night party on Wednesday, June 13, 6 – 9 PM at the gallery, located at 40W Putnam Ave. in Greenwich. Artist Rachelle Oatman will be onsite to speak about her unique anthropomorphic paintings that combine dog portraits on the body of their owners, human body featuring contemporary fashion, haute couture, or historical costume. PAWS of Greenwich volunteers and founder, Jessica DelGuercio will be on site to speak about the importance of pets in our community and the organizations' efforts to clean up the dog park, promote responsible pet ownership and more.